After receiving a letter in the mail proposing $100,000 to lease his 19.5 acre property, filmmaker Josh Fox embarked on a multi-state mission to explore the source, reason, and consequences of hydraulic fracturing; a relatively new process of extracting natural gas. Fox’s documentary, ‘GASLAND,’ paints an in-depth picture of the new part of our county, GASLAND, in what their website calls part travelogue, part expose, part mystery, part bluegrass banjo meltdown, and part showdown. I mention that hydraulic fracturing is a relatively new process; within the last 50-60 years. In a Q & A session at the Sundance Film Festival Fox states that fracturing was used only as a last resort process in the past. Fox mentions the interesting point that “as we are running out of [natural gas] the desperation technique becomes the primary way”. The process of hydraulic fracturing (also known as ‘fracking’) is aimed at forming a fracture within shale or formation rock to make it easier and more efficient to extract natural gas that is trapped within the rock. A hydraulic fracture is formed by injecting 207 million gallons of water per well into a well which creates a pressure that cracks the rock, and allows the fracturing fluid to expand the crack further into the rock. In order to keep the fracture open, the fracture water includes materials such as grains of sand or ceramics. The fluid itself can also be gel, foam, nitrogen or carbon dioxide. In addition to this, there are also 596 (according to Fox) different chemicals used in this process, injected underground, and most of the fluid is left there. It is estimated that 90% of the natural gas wells in the United States actually rely on hydraulic fracturing in order to release and collect natural gas at the demanded rates. The frightening consequence with hydraulic fracturing is the quantity and depth of environmental and health concerns. Essentially there is an explosion of natural gas which then migrates into the water supply of local residents in 34 states including Wyoming, New York, Pennsylvania, Texas, and Colorado. Concerns associated with fracking include air quality deterioration, ground water contamination which then migrates into private water wells, and the mishandling of large amounts of toxic waste. 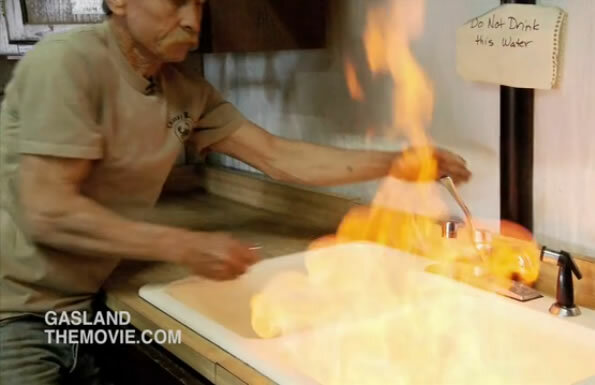 GASLAND exposes where individuals can light their tap water on fire because of the traces of natural gas. The water is contaminated underground and the only way to clean it is to filter it above ground which is costly and requires large amounts of energy. An interesting factor of fracking is that the Energy Policy Act of 2005 actually exempted hydraulic fracturing from the Safe Drinking Water Act, something Fox calls the “Halliburton loophole”. Therefore, complete listings of chemicals used within the process are not available to the public, and the industry is not under federal regulation. Some of the chemicals used include benzene (a highly flammable chemical which if drank could induce vomiting, irritation of the stomach, dizziness, and death), tolulen (a common solvent used to dissolve paints, paint thinners, and silicone sealants), and xylene (a solvent used for the printing, rubber, and leather industries). A group called Energy in Depth has responded to Fox by claiming they have “debunked” GASLAND. For instance, where Fox says 596 chemicals are used in the fracking process, Energy in Depth says there are only 12 used. Energy in Depth states that Fox misstates the law, misrepresents the rules, mischaracterizes the process, and flat out makes stuff up. However, GASLAND explores this real-life issue for many Americans who are suffering through the consequences of fracking. The FRAC Act of 2009 consists of two identical bills introduced to the United States House and the Senate. FRAC stands for Fracturing Responsibility and Awareness of Chemicals Act. The bill removes the fracking industry from being exempt from the Safe Drinking Water Act and requires companies the release the types of chemicals used in the fracking process to the public. With the BP oil spill still occurring, GASLAND provides a look at another part of the energy industry that consists of major concerns on its own. So what can we do? I would recommend exploring the documentary and surrounding interviews with the filmmaker, Josh Fox. After watching many interviews, I recommend one Fox did with Jon Stewart on The Daily Show. Also, talk to people about this problem. It is compelling, relevant, and I believe it will be a major debate (more than it already is) in the near future. 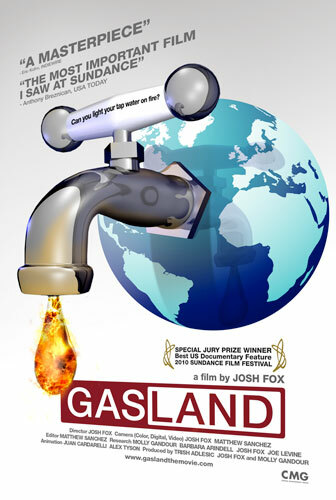 GASLAND can be viewed on HBO on Demand and HBO will re-broadcast the documentary many times over the next two years.